DOMESTIC LEAGUES: Veszprém, Celje, Kielce and Presov continue their domestic dominance, while Löwen claim the German title for the second year running. Part three of the six-part National Champions series focuses on central Europe, where VELUX EHF Champions League sides defended their titles, Rhein-Neckar Löwen claimed the German title, and Alpla Hard and Dukla Praha unseated the defending champions. HC Dukla Praha returned to the top of Czech Republic’s premier competition after a six-year wait, thanks to a 3-1 defeat versus their arch rivals Talent Plzen in the final series. Plzen were crowned champions for the last three years running, but 2016/17 were left frustrated despite winning the regular season. It was a replay of last year’s grand finale. In 2015/16 Dukla were the better team in regular season, had the home advantage in the final series, but ultimately could not benefit from it. This year saw the same situation in reverse, with Dukla claiming their fourth championship title after a 27:26 victory in the last game of the series. Next year, Dukla Praha will participate in the EHF Cup. It is difficult to find a more successful club in Slovakia than TATRAN Presov, but their power is apparently unstoppable. Presov won their 13th Slovakian title in 2016/17, which was their 11th in a row in addition to claiming the Slovakian and Czecho-Slovakian Cups. 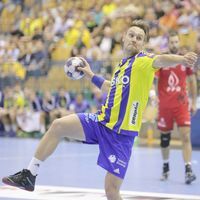 The title series was slightly different compared to previous seasons, as Presov met Challenge Cup quarter-finalists HKM Sala for the first time rather than traditional finals rivals Sporta Hlohovec. Presov won the best-of-five series 3-0. Coach Rastislav Trik collected his fifth Slovakian title with TATRAN Presov, which makes him the most successful coach in the history of the Slovakian Extraliga. Still, he will be replaced by Croatian Slavko Goluza for next season. Celje’s mind-blowing domestic record speaks for itself – 21 league trophies and 20 Cup titles over the 25 years since the Slovenian league was established. Furthermore, Celje have completed the famous double, winning the league and Cup in one season a staggering 18 times; most recently in 2016/17. Next season, however, everything will change. Luka Zvizej has been synonymous with Celje for the better part of the past decade. It has been seven years and 13 titles since the charismatic captain returned to his boyhood club to write history, but after 2016/17, the 36-year-old wing will see out the remainder of his of playing days elsewhere. Coincidentally, the last time Zvizej departed Celje (in 2003), a prosperous period for both the player and club ensued. Celje won the VELUX EHF Champions League in 2004, while Luka Zvizej lifted the very same trophy with Barcelona a year later. When it became clear that Kielce would no longer have a chance of defending their Champions League title, mobilisation on domestic ground reached its highest level. The 2016/17 edition of the PGNiG Superliga featured a brand-new format, with Kielce finishing the group phase as the only unbeaten team and a seven-point lead over runners-up Orlen Wisla Plock. After the victorious Polish Cup, the two-leg final against the Oilers saw two victories for Kielce – 25:24 then 31:29. It was the first time in many years that Kielce could celebrate the championship win at home, as the schedule usually meant they recorded the final victory in Plock. Read about the brand-new format of the PGNiG Superliga in-depth HERE. For the second time in a row, Rhein-Neckar Löwen finished on top of the Bundesliga. In contrast to 2016, when the decision was made in the very last match, the Mannheim-based team earned the title two rounds before the end. Flensburg had sat on top of the ranking for most of the season, but in the end missed their second-ever league title after 2004 by losing to EHF Cup winners Göppingen. After a season without a trophy in 2015/16, record champions THW Kiel won the German Cup by beating Flensburg in the final. In 2016/17, for the first time ever, the Bundesliga was not represented at the VELUX EHF FINAL4 – though Germany continued their dominant role in the EHF Cup, as Frisch Auf Göppingen defended the trophy on home ground, beating Füchse Berlin in the final. Alpla HC Hard dethroned defending champions Fivers Margareten from Vienna in a thrilling final series to claim their sixth title. After winning the first leg in their arena 27:26, Hard became the first team to beat the Fivers at home in more than two years. But Hard needed two periods of extra-time to finish the match with a 32:30 advantage. For coach Petr Hrachovec, who took over at Hard before the 2016/17 season, it was the first trophy in Austria, after he steered Swiss neighbours Kadetten Schaffhausen to three championship titles. Austrian international Roland Schlinger finished his successful career with his 10th Austrian championship title. Only his teammate Michael Knauth beats his record with 11 trophies. Though Fivers did not reclaim their title, their top star Vytautas Ziura defended his trophy as Austrian handball player of the year for the seventh time. The top scorer of the league was Tobias Schöpf (Krems) with 188 goals. Telekom Veszprém, who also won the Hungarian Cup in a thrilling game against Szeged, defended their title in 2016/17 to claim their overall 25th trophy – and continue the series that has seen them win every Hungarian trophy since 2008. In the new competition format this season there were no play-offs, just a two-leg final between the first two teams of the regular season. Surprisingly it was MOL-Pick Szeged that won the regular season, albeit only by a single goal as they lost 24:22 in Veszprém after beating the reigning champions by a three-goal margin in Szeged. The teams met again in the final, where Veszprém won the first leg 23:17 then kept the second match under control, allowing Szeged a 30:27 victory that was not enough to claim the title. In the wake of their excellent EHF Cup run Tatabánya finished third and, as Hungary leapfrogged Spain in the European Handball Federation’s coefficient rankings, the Miners may apply for a wild card spot in the VELUX EHF Champions League.